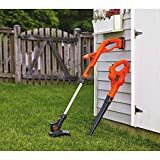 After you have mowed your lawn and you are looking to make the edges clean, one of the best ways to do this is with the best weed eater under $150. Theses affordable machines are great and they you can get them in either electric/corded or operated by gas. Now in this price range, is no shortage of the amount of units that you can choose from and this is why we are here to help you. With that said, out team has looked at many and have read countless reviews so that we could come up with a list of a few of the top rated weed wackers that you can buy for your money. See the selection below. 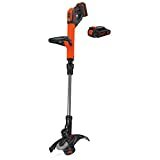 The power that you need to get your yard right can be found in the Black+Decker LST136W String Trimmer. This model is very popular and has over 4000 customer reviews. As you can see this one is in high demand. Features include a powerdrive transmission that provides you with extra power from the motor so that you can get the job done faster. 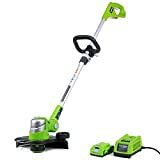 There is also 40V MAX lithium battery along with MAX power and MAX runtime modes and automatic feed spool and it converts from a trimmer to an edger. 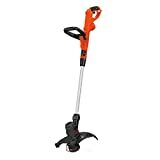 If you are looking to get more done, then check out the Dewalt DCST920B String Trimmer. This brushless model comes in with over 900 reviews and is a top seller in it’s price range. Features include a brushless motor for durability and efficiency along with dual line bump feed and a 13 in cutting swath. It has a patented gear drive design and more.